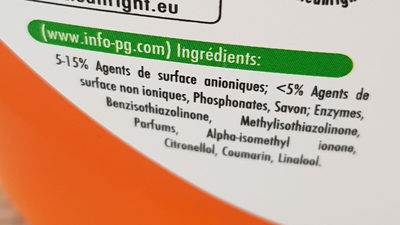 5-15% Agents de surface anioniques; <5% Agents de surface non ioniques, Phosphonates, Savon; Enzymes, Methylisothiazolinone, ionone, Benzisothiazolinone, Parfums, Alpho-isomethyl Citronellol, Coumarin, Linalool. 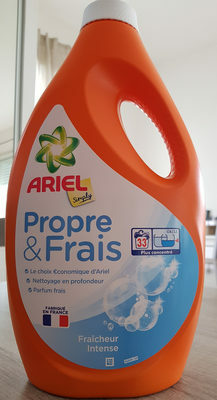 Product added on November 16, 2018 at 12:00:50 PM CET by openfoodfacts-contributors. Last edit of product page on November 16, 2018 at 2:56:39 PM CET by sebleouf.